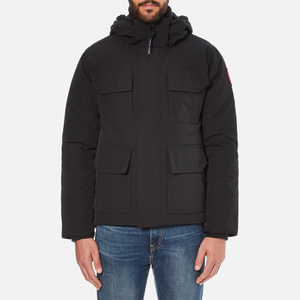 Canada Goose 'Wyndham' navy jacket with warm duck down quilted insulation to protect from extreme cold. The Fusion Fit parka is designed to fit smaller body frames with a shortened body length and sleeves, and a narrower cut body. 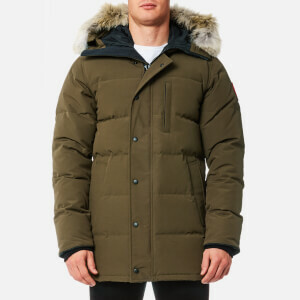 The parka has a removable coyote fur trim around the hood with a shaping wire which is designed to withstand harsh winds. Fastened with a heavy duty two-way locking zip, the slim fit men’s coat is crafted from Arctic Tech fabric to keep you warm and dry in extreme conditions. The parka coat is detailed with double stacked, fleece-line handwarmer pockets with zipper closures. 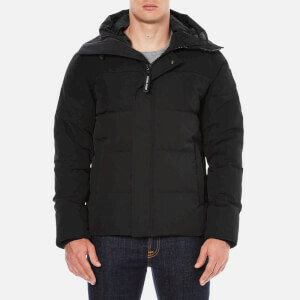 A tricot lined chin guard provides added comfort and protection from the cold when the parka is fully fastened. 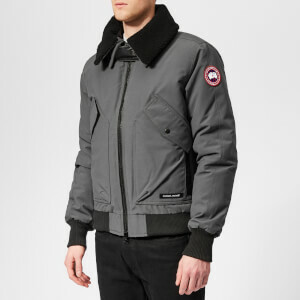 Complete with an embroidered Canada Goose patch on the sleeve and heavy-duty rib-knit cuffs and waistband for additional cold weather protection. Outer: 85% Polyester, 15% Cotton. Fill: 80% White Duck Down, 20% Feather. Trim: Coyote Fur Ruff.